Just like performing routine maintenance on your vehicle, adding air to your bike tires or cleaning your walking shoes, maintaining our bridges is an ongoing task. But as with anything in life, things get old and need to be repaired and replaced. And that's the case with Seattle's I-5 Ship Canal Bridge. Built in 1962, the Ship Canal Bridge is a double-deck structure that about 265,000 vehicles use daily to cross Portage Bay, between the Eastlake and University District neighborhoods. 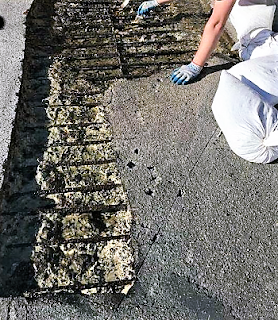 The many years of fluctuating weather, the growing number of vehicles using the roadway and heavy loads from freight have caused extensive wear and tear on the bridge deck. patching the hole up, until funding for a more extensive repair is available. The Ship Canal Bridge is one of more than 300 bridges identified statewide as needing a complete deck overhaul within the next 10 years. Although we inspect it regularly, and make spot repairs as needed, a full-blown rehabilitation hasn't happened on this structure since 1985. The $55 million needed to completely overlay the entire Ship Canal Bridge deck isn't available for at least another 6-to-8 years, around 2026. So until we can fully repave the structure, it's critical that we continue to keep the bridge in a state of good repair. pavement on top of the rebar. Repairing the bridge deck is not a simple, quick task that can be done at any time. Extensive concrete repair needs dry and warm weather, which typically limits us to the spring and summer. We also have to avoid peak travel times and comply with local noise restrictions, while also taking into account needs of other projects and the many major events that happen in Seattle this time of year. There is never a good time to close lanes on I-5. However, we've been working closely with the City of Seattle and large event venues and organizers to pinpoint the weekends with the fewest conflicts in an incredibly vibrant city. It doesn't mean we can completely avoid disruptions, but we're trying to at least limit them. Throughout the summer, we'll be patching potholes and repairing expansion joints. The majority of this weather-dependent work will require closing two lanes and some ramps on I-5 between SR 520 and Northeast 45th Street on Saturday and Sunday mornings, with one closure extending throughout the weekend. June 23-24: Northbound reduced to two lanes from 2 to 10 a.m.
July 8: Southbound reduced to two lanes from 2 to 10 a.m.
*July 15: Southbound reduced to two lanes from 2 a.m. to noon. July 28-29: Northbound reduced to two lanes from 2 to 11 a.m.
*August 11-12: Northbound reduced to two lanes from 2 a.m. to noon. * These weekends we will be working alongside our Revive I-5 contractor crews in order to reduce the amount of weekend closures and minimize delays for travelers. You can keep up to date on specifics of the closures by checking our website. Use alternate routes. Consider using SR 99, I-405, SR 520 or I-90 to avoid delays through the city. Even though the lanes reopen early, we still expect to see up to 9-mile backups. Be a helper. The more people who carpool, use transit or delay discretionary trips, the more manageable the backups and delays will be. We recognize it's not possible for everyone to do this, but those who can help make a difference. Due to limited funding for bridge preservation projects, we need to make the most with what we have right now. This repair work will help buy us more time until funding becomes available to redo the entire bridge deck. And with your help and cooperation, we can do this without causing significant backups. Thank you, as always, for your patience as we complete this much-needed repair work on I-5. I use the SC bridge daily, specifically the express lanes each day each way. I frequently wonder about the stability of the overhead ceiling which is, of course, the floor of the deck above. 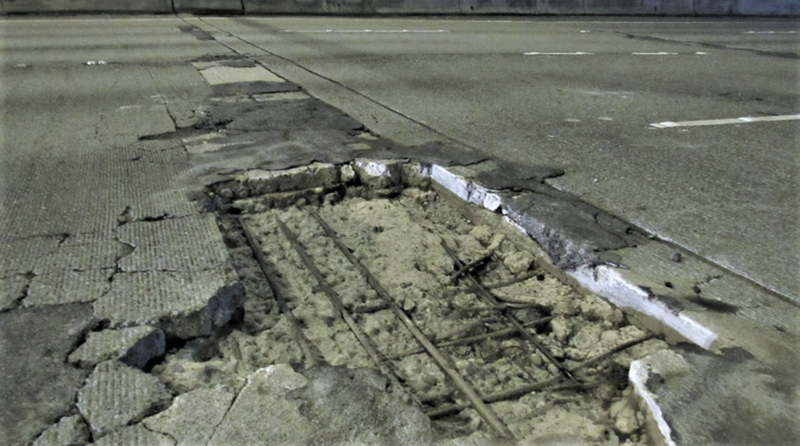 With the concrete above the rebar eroding as in your pictures what keeps the underlying concrete from dropping onto the roadway below? There is a second layer of rebar that’s not visible in the photo that’s buried in the deck. This, in conjunction with the rock in the concrete mix, gives the deck its strength.